Something significant happened last July 21. 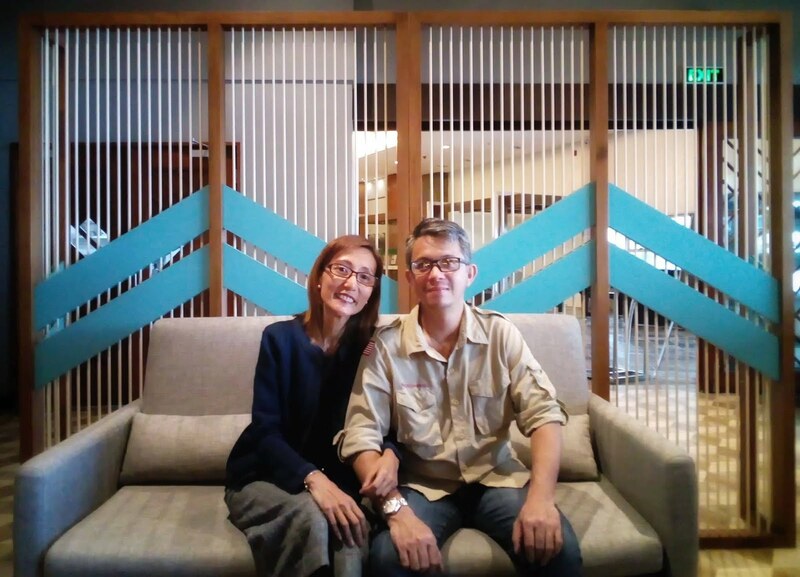 First, it was our 10th wedding anniversary (we were civilly married 10 years ago in the middle of flood and storm). Second, July 21 is our mortgage birthday, and this year marks the end of monthly paying for it. What a milestone, that amidst the challenges, we were able to complete the 10-year payment plan! With our hearts filled with gratitude... we were just so happy that these important events coincided with an invite to visit a new concept restaurant at the heart of Tagaytay -- SARTIN! Sartin is the first venture of Josiah's Hospitality Management, a subsidiary of Josiah's catering, focused on hotel management and food and beverage operation for hotels and resorts. In the middle of a heavy downpour... me, my hubby and daughter, together with fellow bloggers went to Summit Ridge Tagaytay for a world-class food experience. 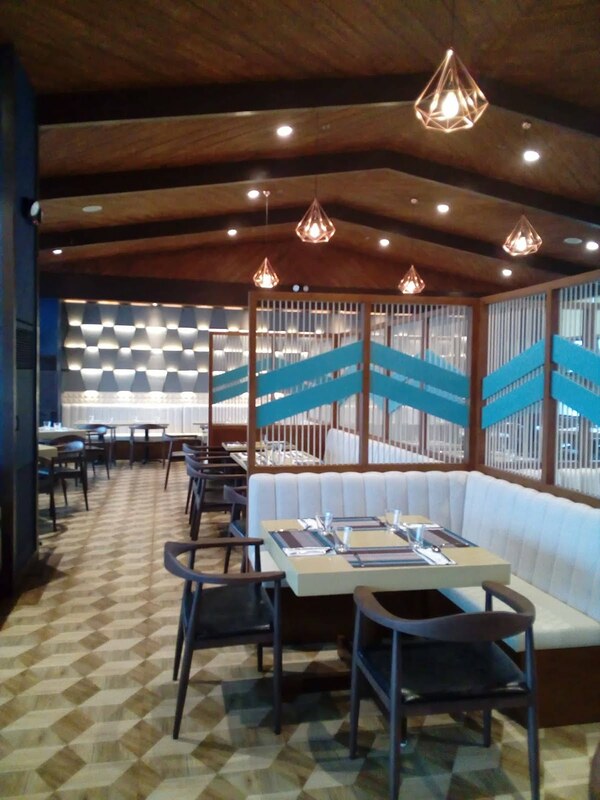 Comfort food and authentic Filipino dishes at its best! First and foremost, I was truly impressed with the restaurant's interior. Clean and very modern. It kindda reminded me of the colors of Ikea. Especially the pendant lights, the gray couches, and blue color as accent. And then came the highlight of our 3-hour trip to Tagaytay -- the FOOD! 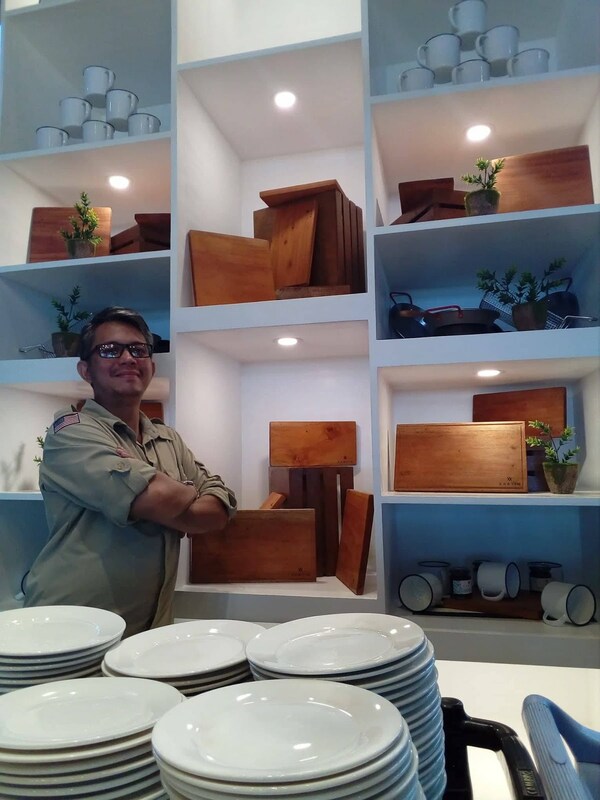 According to Josiah's Catering COO, Fresh Versoza, "We want to make the Tagaytay experience more exciting and delicious for tourists and locals." Sartin uses only the finest, freshest ingredients, and most of it, sourced locally. 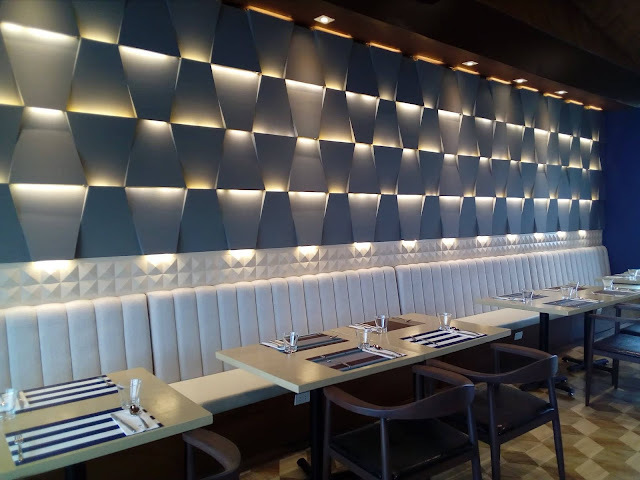 The menu boasts of classic and timeless homemade Filipino recipes inspired by the three distinct hometowns -- Quezon, Tarlac and Bacolod. Recipes prepared in a traditional way but is given a modern twist by Sartin. 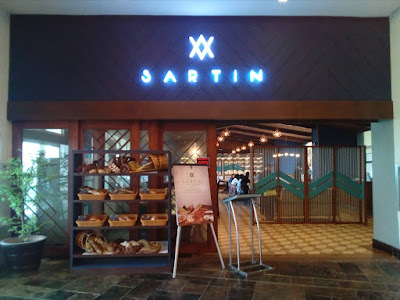 At Sartin, you are creating a unique family history every day just by sharing food and eating it together with them. Good food has a way of bringing families together, and anytime families gather - even to eat - family history is made. Sartin is a story of life, love and family. These are the dishes that were served to us. Not only that they were all instagram-worthy... they were all delish! 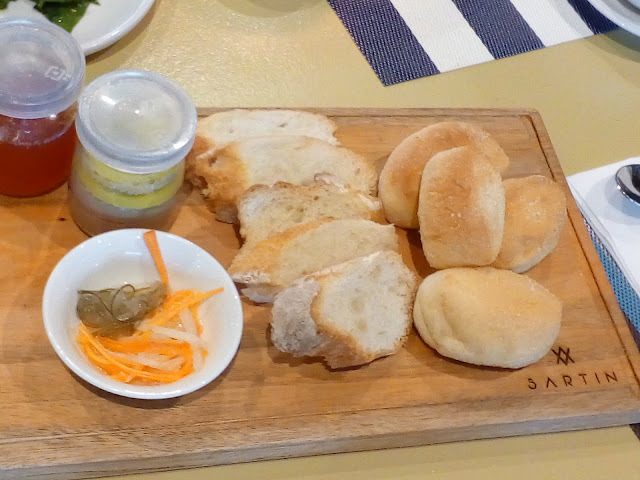 For starters, we sampled on the liver spread, tomato jam and breads. I liked the subtle taste of chicken liver and the hubby liked the tomato jam, which is very similar to a chutney, when it come to taste and consistency. Paired with Sartin's not-too-sweet hot choco, this will definitely make the cold Tagaytay weather very pleasant. Next dish was a fusion. It was a pasta recipe made truly Pinoy with itlog na pula and tinapa. If you like your pasta to be a bit on the salty side, you will love this dish. 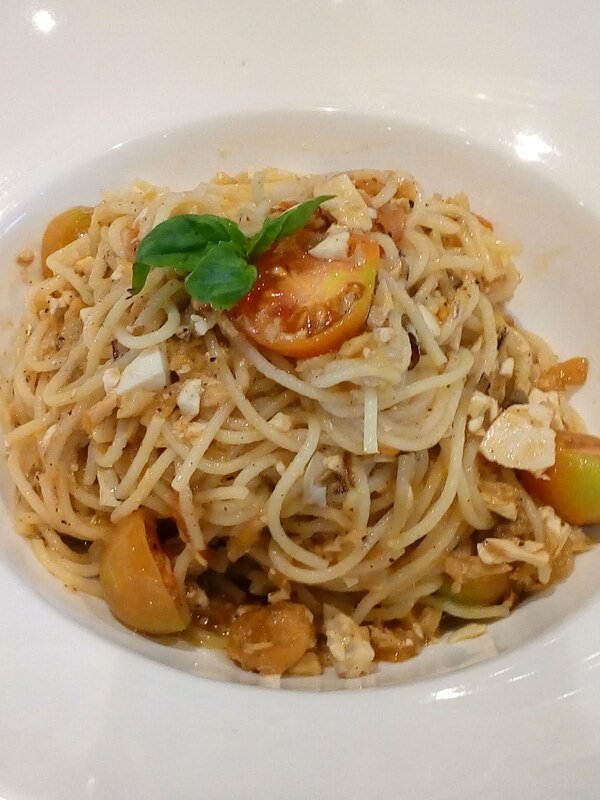 Because tuna pasta is a staple in our household, we were used to this pasta creation. And it was a great idea to use tinapa instead of tuna for a change! It was the first time for us to experience the next 3 dishes -- Apan-apan, Kansi and Laswa. Apan-apan is sauteed kangkong leaves and stems, topped with lechon. You take away the lechon, the combination of kangkong and ginamos (salted and fermented tiny shrimps) is ulam in itself. I mean, I can survive lunch or dinner with just the kangkong, ginamos and rice. I loved the ginamos... it reminds me of bagoong, but it is less salty -- you can put it on top of your rice and you won't feel overwhelmed by its flavor. 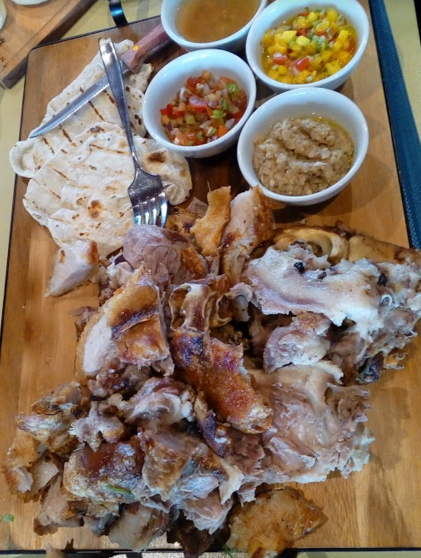 With Sartin's version, they included lechon on top! If was a pleasant twist indeed! 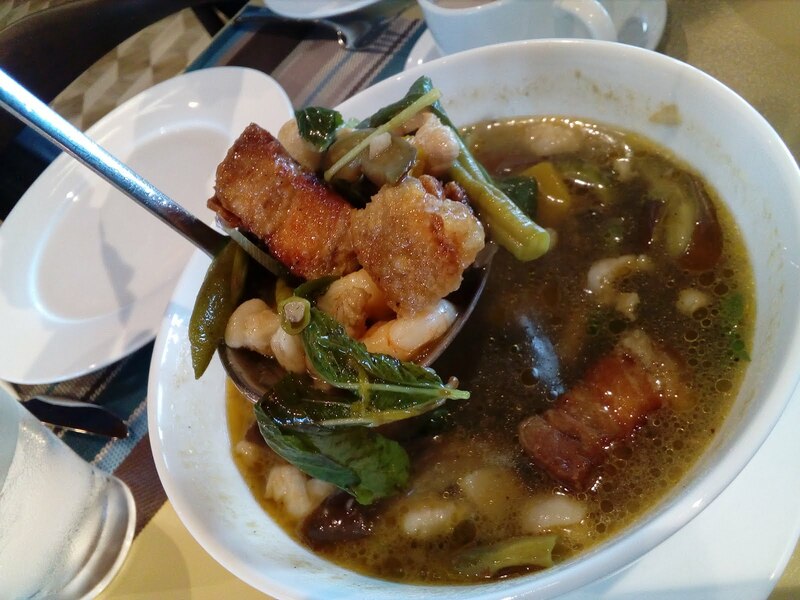 Laswa is a light soup with kalabasa, okra, sitaw, saluyot and shrimps. It reminds me of Pinakbet, with sabaw or the Ilocano dinengdeng. 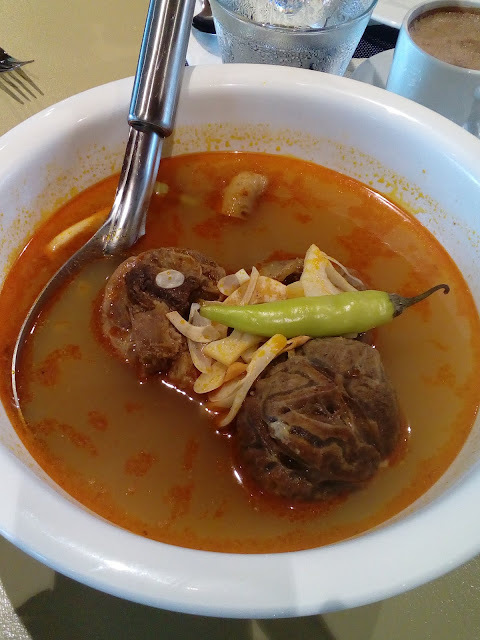 Kansi is the Ilonggo's version of bulalo, slow cooked beef shank with batwan, langka and siling haba. Dahil taal akong taga-Maynila, I am used to using sampaloc, kamias or guava as a souring ingredient. It was the first time I heard (and taste) batwan :) And I enjoyed its not too overpowering sourness. Plus point for me -- the yummy beef litid and bone marrow part... my fave! 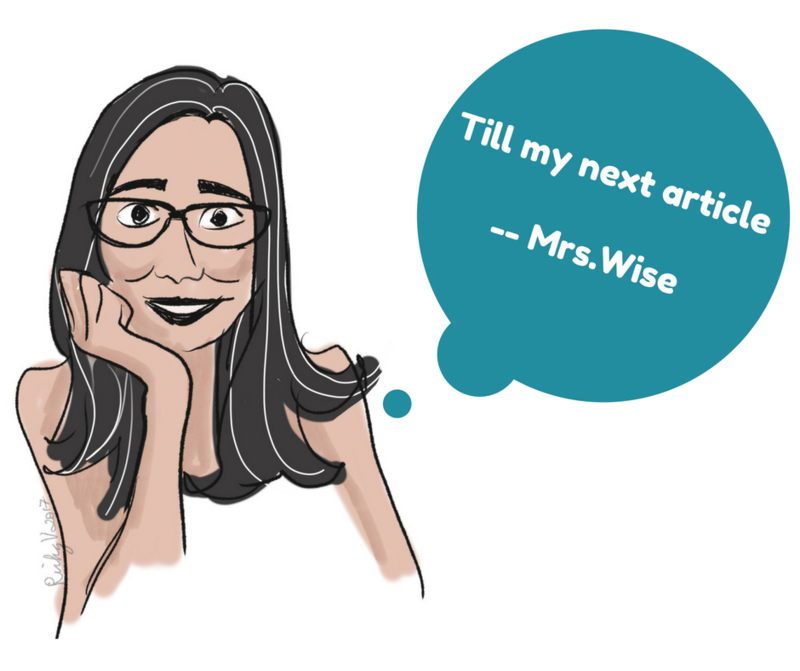 At the start of this article, I mentioned that we are celebrating a milestone on the same day we were at Sartin. The next dish served, was perfect for celebrations - Valenciana. It came from Iloilo, and Ilonggos became accustomed of having it in almost all celebrations --- fiestas, birthdays, reunions. Sartin's version came in turmeric glutinous rice, topped with shrimps, pork, chicken and veggies. 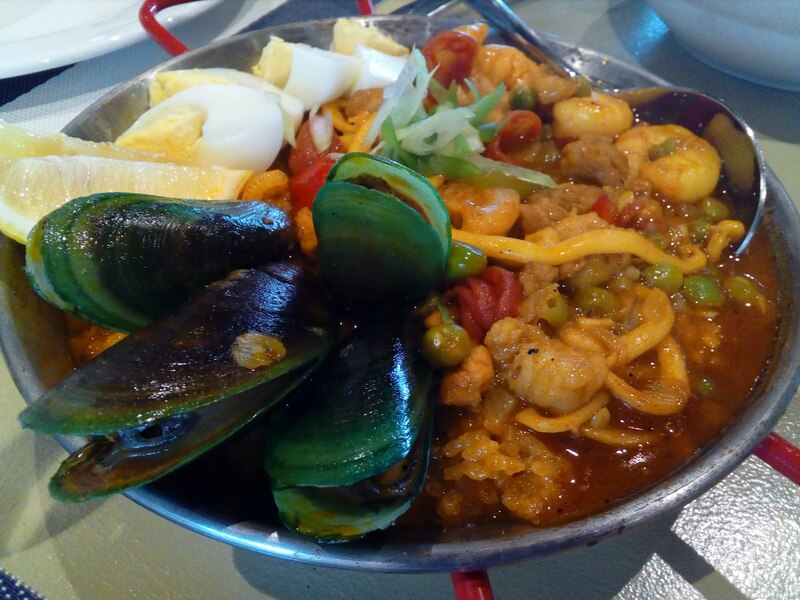 If you love Paella, you'll definitely like Valenciana -- the Ilonggo's version of Paella! I loved the boiled mussels! From Tarlac, we sampled on Kilayin and Pinaupong Manok. 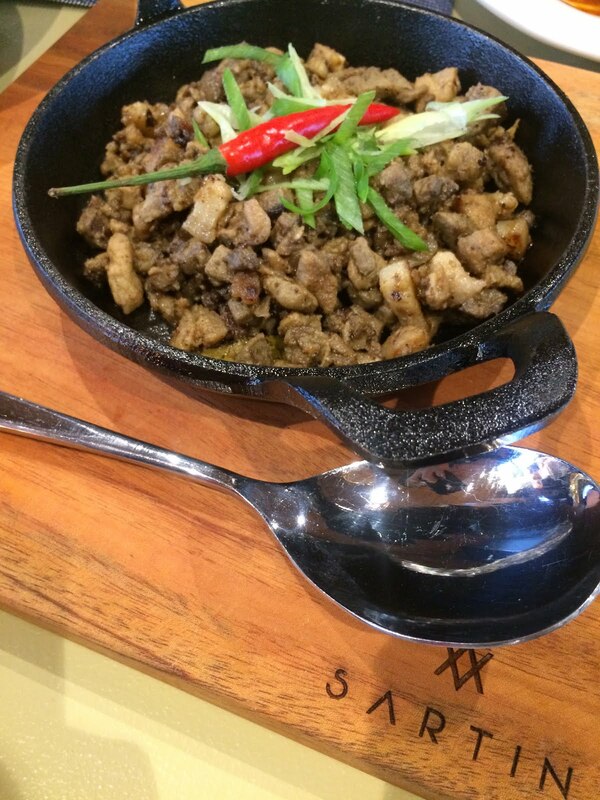 Kilayin Kapampangan is very similar to sisig, but this dish used pork lungs, liver and belly. To me, it is a fusion in texture and taste of two well loved recipes -- sisig and igado! 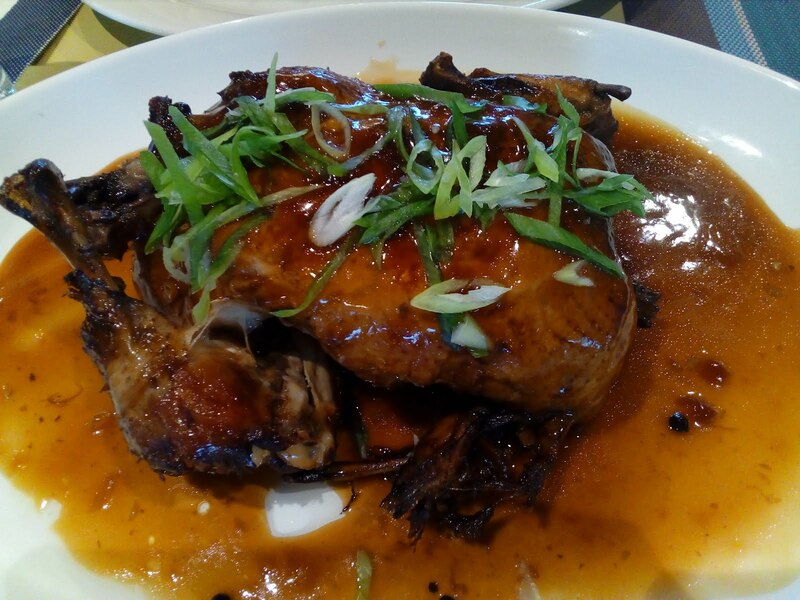 Pinaupong Manok, cooked in salt, oyster sauce, garlic and bay leaf. 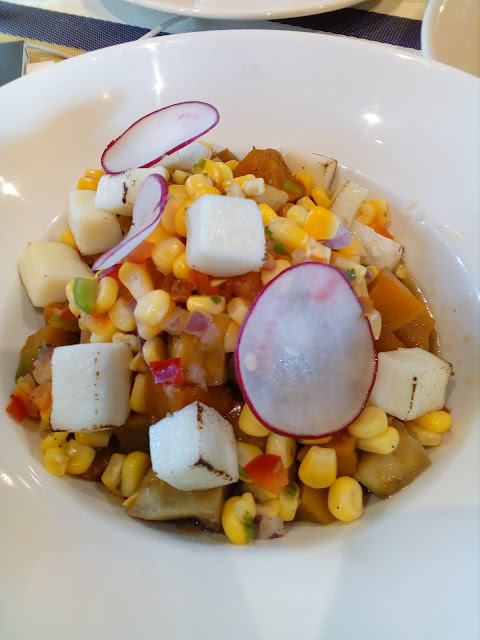 As a seafood lover, my Escabeche na Isda experience was heaven. 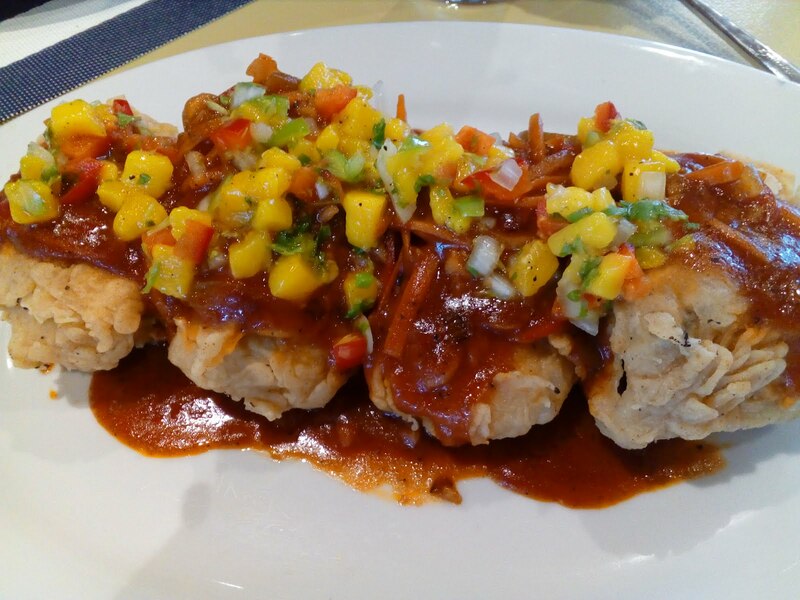 Its sweet and sour flavor, blended well with the Mahi-Mahi. What is excellent about this Sartin's version, the fish was already in fillet form, which is very ideal if you have children in tow. Next dish is Carne Frita. Growing up, tagalog bistek is definitely one of my comfort dishes. And all the growing up memories came back when I tasted Sartin's Carne Frita. 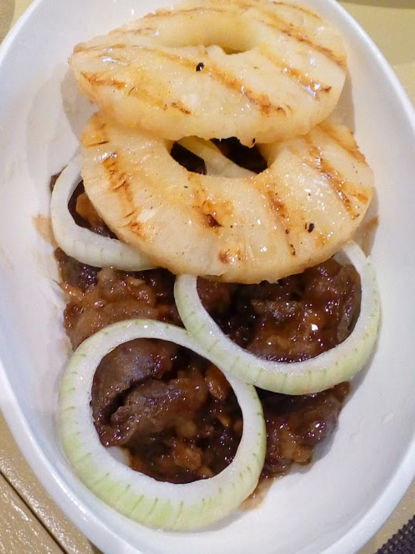 The marinated, thinly sliced beef, cooked in sweet soy garlic sauce, with a tinge of calamansi taste - I LOVE IT! Just like how my mom used to do it -- topped with sweet onion rings. And finally, the star of the show -- Sartin's Lechon na Ulo ng Baboy. This roasted half pig's head is served with homemade thin breads, tomato salsa, mango salsa, vinegar and burong isda. Mr.Wise tried it "ala pritchon" -- and yes, he finished all the bread hahaha! I tried it with all the dips -- and I must say, I love it vinegar and salsa. Not much with the buro. The skin is very crunchy, roasted to perfection. 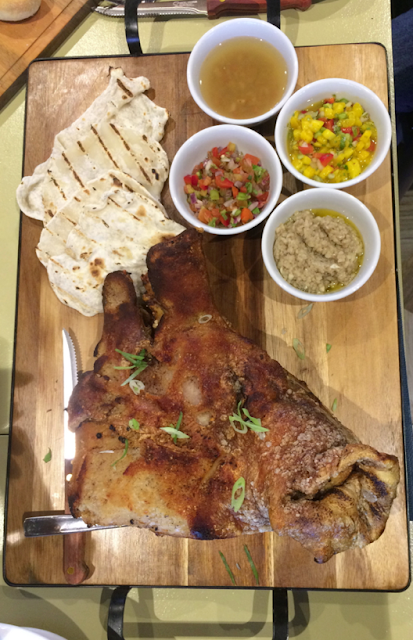 And because I am a huge fan of the soft bone/cartilage part in pork -- I enjoyed it! But goodness.... at Php949, it was so good, it can satisfy 4-5 people already. Just order extra rice, and you're good! I think this is a WISE choice to order! For dessert, we had the Tibok-tibok. This is the second time to taste this native delicacy from Pampanga. 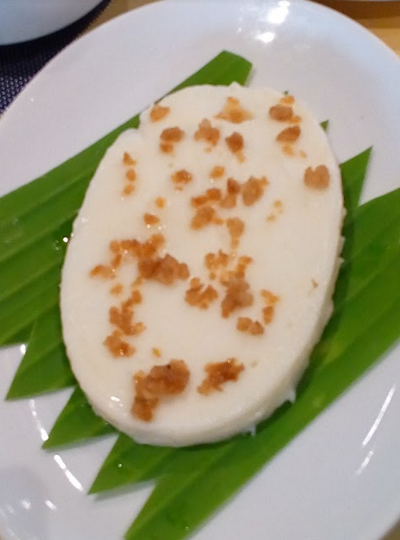 Sartin's version, is more flavorful and I love the sticky, gelatin-like texture. Admittedly, I had 3 servings of this wonderful dessert. Did we have a grand time? Oh yes... Sartin is your best choice timeless homemade Pinoy recipes to be shared with the entire family!